Facebook has given up trying to build its own drones. The idea was that the high altitude unmanned aircraft would beam Internet access down to the ground in remote areas where Internet was not available via conventional terrestrial delivery. Facebook's drone only had two flights, and the second one incurred "substantial damage." The company indicates it will continue to work with companies like Airbus deliver Internet "to the masses...." I'm not sure if the author of the article used the term "masses" or if Facebook did, but we're not "masses" down here. Gizmodo has a very detailed analysis of cellular "unlimited" plans that is a great example of why wireless broadband is never going to be a complete substitute for fiber service. The carriers would not carry out this wordsmithed subterfuge if they did not have to, but the problem is very simple. We all keep using more bandwidth, and the bandwidth available from free space wireless in any given frequency range (e.g. 3G, 4G, 5G, LTE, etc.) is strictly limited by physics. Fiber, on the other hand, can have its capacity upgraded easily without having to replace it. Hat tip to Eldo Telecom. ...because who needs fiber when wireless will handle everything? The Wall Street Journal has a article on the shortage of wireless spectrum and the problems it is going to create. It's short--just click over and read it. The always insightful Eldo Telecom points to a news item that quotes a telecom analyst who tried to use the much ballyhooed LTE for several months as his primary broadband connection. He gave up and went back to a landline, partly because of the cost and partly because of performance. The money quote is, "There's just not enough capacity there." Ars Technica has an article on problems with WiMax and cellular wireless networks. As customers increase their use of high bandwidth services, the wireless networks can't keep up, and the result is that companies like Verizon and Clearwire have started reducing the amount of bandwidth they make available to subscribers. Clearwire's much ballyhooed WiMax network, just a few years old, is already congested and inadequate. And the much hyped 4G cellular data networks are not going to perform any better. The things that people want to do with their wired and unwired devices is accelerating faster than the ability of wireless networks to keep up. The problem with wireless networks is that you basically have to replace everything component in the network except the tower to add more bandwidth, so you are looking at something like 80% of the cost of the original investment to get an upgrade. With fiber, you can add bandwidth incrementally to individual customers who need it at very low cost, and if you did have to do a systemwide bandwidth upgrade for all customers (very unlikely), you would be looking at only about 20% of the original investment. Wireless networks simply don't work without fiber. But fiber networks don't need wireless. It's simply physics, and marketing hype loses out to physics every time. This article illustrates perfectly everything that is wrong with wireless broadband, and in particular with cellular wireless. As Verizon rolls out the iPhone on its older and slower CDMA network, it is also taking a page from the AT&T playbook of three years ago. At that time, AT&T touted its "superfast" 3G network for the iPhone, even though it was not widely available at the time; most early iPhone users found themselves accessing AT&T's slower Edge network, which is closer in performance to Verizon's CDMA network. So today, Verizon is touting its "superfast" LTE network for the iPhone, even though it is not widely available. And of course, all these "superfast" speeds being touted are modified with the infamous "...up to...," meaning you won't get anything like the advertised speed, because lots of other cellphone users will be trying to access the same radio on the same celltower. So if LTE offers speeds "up to" 12 megabits/second, and you and nineteen other people happen to be accessing the same radio on the same cell tower, what you really get, on average, is something like 600 kilobits/second. Not at all bad for casual data use on a cellphone, but you won't be streaming a Netflix movie over that connection. And if some is trying to stream a Netflix movie over that radio on that tower, expect your speed to be more like dial up. The cellular voice/data wireless network is an amazing technological tour de force, and its continued expansion and availability are critical to supporting our desire for ubiquitous mobile access. You can argue about the cost, but it works amazing well. 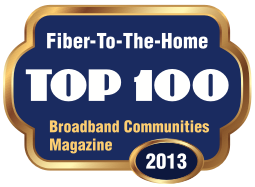 But it is not a replacement for fiber connectivity to the home and business. In some areas, particularly some rural areas that need four to six years to get fiber to most residents, cellular wireless will be an important interim option to get folks off dial up. But communities that have fiber will have an important economic development and jobs development tool that communities betting on wireless won't have. Verizon now has the iPhone. Ho-hum. Despite some early network capacity problems, my AT&T service has been excellent. I travel all over the country, including a lot of rural areas and big cities, and my AT&T iPhone works virtually everywhere. I get the fast 3G service almost everywhere. AT&T really has spent a lot of money upgrading their network, and it shows. The AT&T network is GSM, unlike Verizon's CDMA network. The GSM network is able to handle voice and data traffic on the phone simultaneously, while the CDMA network can't do that. Is it a big deal? Maybe not, but I often put my phone on speaker while I check mail or look up something on the Web. Can't do that with the Verizon iPhone. And GSM phones work almost everywhere in the world. I know a lot of people don't care about that. Why spend the money? Switching from AT&T to Verizon means getting a new phone, because of the differences between GSM and CDMA. Unless you have a fairly old AT&T contract, a switcher can expect to spend between $100 and $200 in penalties and will also have to pay for a new phone. For basically the same service. Now I do know at least one person who lives in an area where there is no AT&T service, and I know there are more, but these folks are switchers, they are brand new customers--a big difference. Verizon is offering one thing you can't get from AT&T right now, which is the ability use your Verizon iPhone as a mini WiFi hotspot for up to 5 other devices. But there is a gotcha--while you are doing that, you can't make calls. And I suspect AT&T will finally allow tethering with less fuss, so that you can use your phone as a mobile modem for your laptop. The hotspot is not a big deal, as I can do that from my laptop. I also expect AT&T to moderate some of their service plans to help keep customers. Competition is good--I'm glad Verizon has the iPhone now, as it will help keep AT&T more customer-focused. And remember: Apple offered the iPhone to Verizon first, and Verizon turned them down. Let's hope that whoever made that decision is repairing cellphones in Afghanistan. AT&T has indicated that the use of broadband data on its cellular wireless network has slowed. Over the past two years, the company has seen data usage increase by 3000 percent. In the past quarter, the rate of increase has "slowed" to just 30X, down substantially from the previous 50x increases. Wireless has a critical long term role providing mobile access to the 'net, and in fact, voice traffic on cellular networks will eventually transition to VoIP service on the data portion, which will free up a bit more bandwidth. The ideal network is fiber rich, with fiber to every home and busines, and with fiber to every cellular data tower to keep those mobile data costs as low as possible. But with Netflix now consuming 20% of the nation's bandwidth every evening, we aren't going to be watching TV and movies on our wireless connections with any reasonable expectation of quality. Their is a structural problem with wireless, and that is that they aren't making any more RF bandwidth--this is basic physics. Fiber? Bandwidth is not much an issue, as the physics of fiber is the opposite of wireless: need more bandwidth on your fiber connection? No problem: push more colors (wavelengths) of light DOWN THE SAME FIBER. Bingo--more bandwidth. Fiber is future proof. The single most common question we get from elected and appointed officials as we plan next generation, future proof networks for communities is, "How do we know some wireless technology won't come along in five years and make fiber obsolete?" The answer, as I have noted above, is physics; physics makes fiber the safe bet for fixed point access, and physics makes wireless the best bet for mobile access. WaPo: "Tech firms dreaming of wireless boom"
There is so much confusion and mis-direction in this article that it is hard to know where to start, and I don't really blame Cecilia Kang, the Washington Post reporter who wrote the article. She interviewed a bunch of wireless equipment vendors and wireless services firms, and it those firms that are doing the dreaming. And most of it is dreaming. If the FCC does release additional spectrum for wireless broadband use, it will be years before off the shelf commercial devices are available for it. Standards and protocols have to be developed, which is a contentious and time-consuming effort. And then new chips have to be designed and new equipment for the chips has to be rolled out. And the industry then has to convince current users to throw away all their existing equipment and buy new. Perhaps the silliest statement in the article is about the "vast" potential, which was "validated" by pointing out that over "1 billion" WiFi chips are already in laptops, cellphones, and other devices. Um, are we going to throw all those away and buy new everything? I don't think so. Remember WiMax? No one else does either. WiMax was going to solve all the world's problems just four or five years ago. The was a "WiMax Industry Summit" in every major city in the U.S. just about every week for about two years. Where is WiMax today? Nowhere. Now LTE is supposed to be so much better than WiMax. The two wireless protocols have much in common in terms of performance and capacity, but the point is that the "WiMax revolution" has already been passed by before it started by LTE. Meanwhile, laptop and portable device vendors keep releasing products using the same old protocols that are supposedly outmoded (i.e. WiFi). And that's the problem with wireless--to get more performance, you have to throw away 90% of your original capital investment and replace everything. On the other hand, if you need more capacity with fiber, you can cheaply and easily increase any fiber link by simply replacing the equipment on each end of the fiber--you don't have to "upgrade" the fiber itself. Want proof that LTE/WiMax/White space is NOT going to solve all the world's problems? Look at poor AT&T and their experience with the iPhone. When the iPhone was released, they thought they might have to double network capacity, but it turns out that iPhone users fooled them--the company has found that the smartphone owners use between ten and 100 times more data bandwidth than other cellphone customers. And it keeps getting worse--as the iPhone gets faster, iPhone owners use even more bandwidth. As fast as the company rolls out more capacity, it gets used up, because customers can do more, like watch major league baseball live video streams, which just crushes AT&T's network. Wireless is important, but it is not cheap, and we all still need fiber connections at home and at work. Wireless is essential for mobility access to the 'net, but it is not a replacement for fiber--it's a complement to fiber. WiMax, which was going to solve everyone's broadband problems three years ago, may already be dead, without ever really being deployed in any meaningful way. This short article suggests that Clearwire is thinking seriously about switching from WiMax to LTE for its primary wireless deployment technology. LTE (Long Term Evolution) is, depending a couple of different variants, a 3G or 4G cellular wireless technology that has much higher bandwidth than current 3G cellular wireless systems. As is usual, the makers of LTE equipment are touting very high (read: exaggerated) upload and download speeds that are always predicated with the handy phrase "up to..." But like all wireless technologies, you have to share that bandwidth with everyone else using the same tower/access point, so your mileage will vary greatly. A convenient rule of thumb for evaluating actual wireless bandwidth is to take the maximum "up to" number and divide by ten. The result is more likely what most users will see in practice. Will LTE be an improvement? Very likely. But it means replacing your current wireless device with a new one, among other problems. Mobile phone manufacturers like these changes in technology, as it forces millions of people to buy new phones. But companies like AT&T are not even done building out adequate 3G networks using the "old" 3G technologies. The transition will be slow. And we will still all want fiber. Nobody is going to be delivering HD movies on demand over an LTE wireless network, no matter what the vendors claim the "up to" bandwidth is. AT&T has announced changes to its U.S. data plans for iPhones and iPads. Most current iPhone users pay $30/month for an unlimited data plan. A bit pricey, but you know what you are paying every month, and you don't have to worry about surprise charges on your next month's bill (I've had an iPhone for two years). Under the two new plans, there is no unlimited option for the iPhone. Instead, there are two plans that provide 200 Meg ($15/month) and 2 Gig ($25/month) of data. Overage charges are actually fairly priced, in my opinion, rather than some of the punitive charges we have seen from some cellular providers in the past. iPad users have a choice of two similar plans, one that provides 250 Meg ($15/month) and an unlimited plan ($30/month). The big news is that AT&T will finally allow tethering, meaning you can use your iPhone as a cellular modem for your laptop while traveling. AT&T is going to charge an additional $20/month for this service. iPhone users have been waiting a long time for this, and I think the additional charge is fair. Tethering your laptop is going to use a lot more bandwidth than equivalent Web browsing and data on an iPhone. And the $20/month charge competes very favorably with the cost of buying a dedicated cellular modem service (these plans tend to run about $30/month). I am ready to sign up for the tethering plan. Free WiFi services while traveling are often hard to find and if you do find one, performance is typically abysmal--slow when working, and often not working, especially in airports, where I most often want to try to get some work done. AT&T is also promising easy to use tools to keep track of how much data you have used over the course of a month so that you can avoid overage charges. This is essential to keep from annoying customers. Mobile data access is increasing rapidly as more people have smartphones and pad computers, and the cellular providers have to do something to manage bandwidth. The big weakness of wireless broadband is that there is only so much spectrum to go around, and when demand uses up the bandwidth available from an access point, the wireless provider has only one option--a costly upgrade to the access point and/or adding more access points and more backhaul--all expensive. Steven Levy has a Wired article that illustrates some of the problems that Google, and by extension, all cellphone users face. The new Google Nexus One can be purchased unlocked and without a cellular contract. You can then (in theory) go to any provider and get a service contract. Except, as Levy points out, even if you paid $500 for your dandy new Nexus One phone, you are not likely to a) find a provider willing to sell you service, and b), if you do find a provider (T-Mobile is the only one so far), you won't get a discount on the service contract. The only glimmer of hope is that with all the new iPhone imitations coming to market, the increased competition for smartphone customers, who tend to spend more because they buy both voice and data service, has lowered prices a bit. But the lower prices is so far limited to the unlimited contracts, which were already very expensive. The cost of these contracts is coming down by $20 to $30, but are probably still very profitable. When there is real competition, prices can and often do come down. But the cellular business looks a lot like a cartel, with cartel-like pricing. This is an illustration of why open access networks, with community ownership, are so important. Only by making investments in owning some of the infrastructure do users (local governments, schools, businesses, residents) get some control over the market space. When telecom infrastructure is owned entirely by one company (e.g. phone/DSL, cable TV/cable Internet), the company that owns the infrastructure gets to set the pricing--and rightly so. I don't subscribe to the notion that incumbents are bad. They are making intelligent pricing decisions based on their asset and business models. Communities that want better and more affordable telecom services have to introduce different asset ownership models and different business models. It's not hard or complicated, and many communities are already doing this with excellent results. Call Design Nine (540-951-4400) if you want more information on how to get started. Will the iTablet finally bring true data roaming? New rumors about the Apple iTablet (or iSlate, or iSomething) suggest that it may come with 3G wireless network access built in. Big deal, since all smartphones already have this, right? No, the rumormongers are suggesting that iTablet owners will be able to pick and choose from several different cellular providers--but only for data, not voice. It is likely that current cellular roaming agreements that make it possible to use your cellphone on any network would be modified to allow data roaming independent of voice contracts. If this happens, it will be good news/bad news for the cellular industry. Good news in the sense that it will bring an entirely new stream of revenue to them--every iTablet owner who already has a cellphone contract will likely purchase a second contract for data roaming, and the cost will probably run $40 to $50 per month. The bad news is that the tablet will put even more pressure on cellular networks, as high bandwidth uses like watching TV shows, movies, YouTube videos, and video chat will explode. Want to bet that the iSlate will have Apple's iSight video webcam built in, just the way current Apple laptops have the tiny camera built in? Bet on it, and expect an explosion in video-enabled Skype use among iTablet owners. There is potentially good news for rural communities suffering from lack of broadband and poor or nonexistent cellphone service. The new revenue streams that are likely to emerge may help improve the business case to expand wireless voice and data services into rural areas previously difficult to justify from a revenue perspective. But community broadband networks, powered by fiber, will still be needed to support commerce, jobs, and economic development. Here's the funny thing about the iTablet--Apple had has this vision for at least 22 years--it has just taken this long for the technolgy to catch up with the Knowledge Navigator.